I am back from a wonderful vacation in Australia. I highly recommend a trip there if ever you have the chance to visit. During the trip I had several occasions to think about aviation. How can you not when you lift off in a 747 from Los Angeles for a 14+ hour flight that is over the Pacific Ocean for all but 15 minutes of the flight to Sydney? I had recently read about Australian Aviation Hero Charles Kingsford Smith who was the first to fly across the pacific in 1928. He was an aviator that has largely been overlooked by many historians despite many remarkable accomplishments. One that came to mind while flying to Australia was his flight in the Southern Cross, a Fokker FVIIb-3m with Wright Whirlwind engines, from Oakland to Hawaii on to Fiji then the final leg to Brisbane, Australia. In 1928 it took him over 3 days of flying spread out over nine days. We made our flight in fourteen hours in the comfort of a United Boeing 747. After arriving in Sydney we had a brief layover before departing for Melbourne. I took the opportunity to head upstairs to the flight deck and introduce myself to the pilots who showed me around the cockpit before our flight. It was fun to see the view from the cockpit of this enormous plane. The pilot mentioned that prior to 9/11 knowing I was a pilot they would have invited me up to the cockpit to enjoy the flight, now that would have been a great time. Australia is an active country in which the Australians make sure to enjoy their passions whether it be footy, rugby, running, motor sports or flying. While driving the Great Ocean Road near Melbourne (an absolutely amazing and beautiful drive). We came across about 8-10 hang gliders floating over a mountain ridge along the ocean. They must have had the most amazing views. Driving a little further we came across their beach front landing zone. I think I might have to give that type of flying a try some time. While in the Outback we visited the Royal Flying Doctor Service (RFDS) Museum in Alice Springs. The RFDS is a not-for-profit charitable service that provides emergency and primary health care services to people who are in remote areas of Australia. Australia is a vast nation with many of the people living in remote locations and the only way for them to receive primary and emergency health care is via airplane. Annually, the RFDS attends to nearly 200,000 patients and provides over 25,000 aerial evacuations using their 40 aircraft fleet. The RFDS museum is located at the Alice Springs Base one of 22 in Australia. You get to view the operations center from which they plan their scheduled daily flights to provide clinics in different regions of the Northern Territory and where when necessary emergency flights are planned. Unfortunately, I did not get a chance to do any flying of my own while in Australia. I can imagine it would be a great place to be a private pilot. National Geographic has an interesting article online about Tom Clynes who learned to fly on a 1,700 mile aerial tour of Eastern Australia. During our return flight from Sydney we learned that this was the final flight for the Captain as he would be retiring after a 21 year career with United Airlines. Upon arrival into Los Angeles the L.A. Fire Department provided a water cannon salute to the Captain and his 747 in honor of his career. Water cannon salutes are a tradition for the completion of a commercial pilot�s last flight. Speaking of flying, I reserved a plane for tomorrow night and am looking forward to doing some flying of my own. I plan to fly out of Schaumburg in the same Cessna 172 that I flew last time. This plane is equipped with GPS navigation and autopilot both I which I look forward to becoming better familiarized with. I have scheduled a plane for Friday evening. For the first time in weeks I have some free time and the weather looks like it will be nice enough to go flying. According to LogbookPro I have not made well on my New Years resolution to fly 24+ hours in 2006 or 2 hours per month. I have only flown .7 hours since January first. I am sure I will have no trouble meeting or exceeding my hours goal as I prefer to fly as it starts to get a little warmer and the days start to get longer. Heading to the airport on a Friday evening is a perfect way to start a weekend. I look forward to getting back in the air. Since I have not flown much over the winter I plan to take a few refresher flights with a flight instructor. Additionally, I plan to spend a few hours reviewing some of my aviation books and my Sporty's Private Pilot Training DVDs. 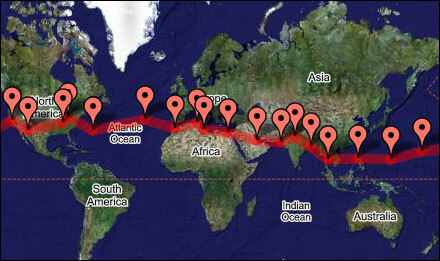 I recently posted about Jerrie Mock's record-setting flight around the world. When she completed her 29 1/2 day flight that covered over 23,000 miles she became the first woman to fly solo around the world. I have been captivated by this story. Since I prefer pictures over words I decided to make a Google Map that shows the route she flew and lists each checkpoint along the route. I also provide the time it took to fly the leg and the miles flown per leg. I hope the map and my recent post drives you to your nearest library to check out the book about her flight - Three-Eight Charlie. View a small version of the map (optimized for 800x600 screen resolution). Do you know who the first woman to fly solo around the world was? Up until a few weeks ago I could not have answered that question. Many mistakenly answer the question with Amelia Earhart, but she sadly was lost after completing 75% of her journey and she had a navigator along with her. The correct answer is Jerrie Mock, a 38 year old woman from Ohio. I just finished reading about her historic 1964 flight. She flew over 23,000 miles in 29 days through terrible conditions including: sandstorms, thunderstorms, icing, rain and excessive heat. 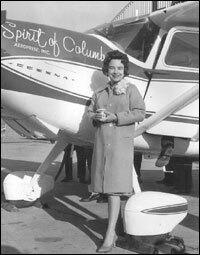 Her only companion on this flight was Charlie, a Cessna 180 Skywagon with an FAA Registration of N1538C (November one five three eight charlie) and title the Spirit of Columbus. I learned about Jerrie Mock from Dan Pimentel "Av8rDan" who had the exclusive movie rights to Jerrie's story and developed a screenplay based on his research and interviews. You can learn more about his screenplay project on the Three Eight Charlie website or the project blog. After reading about the project I decided I needed to learn more so I went to the library and checked out Jerrie's book on the historic flight, Three-Eight Charlie, which was an enjoyable read. During her flight she had to battle fatigue, equipment problems (radio malfunctions, rough engines and electrical fires) in addition to the afore mentioned difficult weather conditions. If all that was not enough to make it exciting, Jerrie has to leave earlier than planned as another woman aviator decided to make a race of it. It was interesting to learn about the state of aviation in the 60s from her perspective, as Jerrie visited 14 countries including places like: Casablanca, Calcutta, Bangkok, Cairo and Wake Island that had varying levels of sophistication towards aviation. She did a nice job of balancing stories about the flights themselves with tales of her time on the ground at each checkpoint. The trip was filled with exciting moments that concluded on April 17, 1964 when she flew into the history books by completing the 29 day, 23, 206.36 mile journey around the world. I encourage you all to check this book out of your library. Then spend some time checking out Dan's sites about Three Eight Charlie and Jerrie Mock. I would love to see this story be told on the big screen! You may notice some new tools and features on the website. First, I have added several new aviation based blogs to the blogroll on the right. My favorite new blog is Av8rdan's World of Flying. If you have not checked it out, do so today. Additionally, I have added a sidebar section called "Sharing My Learning to Fly Knowledge". Here you will find links to other sites where I share my experiences of learning to fly. The first site linked to is Squidoo.com which allows people to host a page about something they are passionate or knowledgeable about. My Learn to Fly page is currently featured in their Top 100 list. Another place I am sharing my experiences regarding learning to fly is on offered a favor in which I offer to share my thoughts on what it takes to earn a license and to help explain how to decide where and how to train. I signed up today and have already helped one gentleman from Ontario with a few questions he had about the steps needed to earn a private pilots license. Lastly, I came across a cool site yesterday for viewing sectionals online - www.skyvector.com. The site also allows you to add a mini-map to your own website. I have added a map showing the Chicago area where I fly. Dave, the owner of the site, does warn not to use the online maps for flying and I would have to agree with him. But it is a great use of technology and fun to look at. Nice work, Dave! As I have written here on many occassions I have many passions; two of which are aviation and the Internet. I love when I find ways to mix the two interests. Today I came accross a new tool offered by fboweb.com. The site's charter is to simplify and streamline the processes involved in all aspects of aviation. In doing that they have created a suite of flight tracking software that makes them the Internet's most popular web-based flight tracking service. In the past I have used their site to track status of a a commercial flight that a friend or family member might be travelling on. The traditional display was a basic map displayed in the browser. 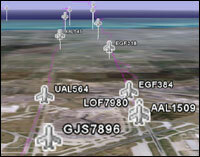 fboweb.com recently began integrating Google Earth into its service offerings, allowing users to track flights in 3D. If you search for a flight you will be see an icon to map the flight on Google Earth and to see a 3D rendering of the flight plan with relevant information such as flight number, altitude and air speed. Even more fun is that they offer Google Earth add-ons that show traffic going to some of the country's most popular airports including: Los Angeles, Boston, Chicago's O'Hare, Atlanta and New York's John F. Kennedy. Download the files for these airports for use in Google Maps. Once you load the map, be sure to zoom in towards each airport and tilt the camera up from the runways to watch them land! The picture to the right is showing the flights coming in over Lake Michigan landing on 27L and 27R. If you are an aviation buff download Google Earth and head over to fboweb.com today. I am sure most pilots set goals to fly more hours each year. I started flying in April of 2004 with a heavy concentration between April and August, in which I flew 47.2 hours, culminating in earning my Private Pilots License on August 1, 2004. I continued to fly frequently into the winter of 2004, completing the year with 63.3 hours of flight time. My flight time was decreased in 2005 in a year of transition where I moved from Cincinnati, Ohio to Chicago, Illinois. Between a new job and new city I had less free time to get out to the airport. In 2005 I only logged 12.6 hours, just over an hour per month. My goal for 2006 is to at least double that number. I plan on doing that by finally buckling down and choosing a home base airport and FBO. I am looking at a variety of airports and FBOs ranging from Midway Aviators based at Midway, Windy City Flyers at Palwaukee, Stick & Rudder Club at Waukegan and an FBO at Schamburg. Additionally, in 2006, I would like to fly some more solo cross-country flights exploring new airports and scenery. I look forward to sharing my 2006 flight experiences with you! In a recent post I wrote about paper airplanes and now I am doing a complete 180° change from the simplest and cheapest of flying machines to what might be the most advanced and one of the most expensive general aviation aircraft Javelin MK-10. The Javelin is a two seat multi-jet engine powered general aviation aircraft built by the Aviation Technical Group that can get your cruising at .90 mach. According to their website the driving concept being the Javelin MK-10 is "to combine state-of-the-art glass instrumentation, safety features, and wide-fan sweep technology jet engines into a two-place executive jet. With its high speed, maneuverability, and unprecedented performance, coupled with the economy, reliability, and comfort of a light business jet, the Javelin has no equal in general aviation. 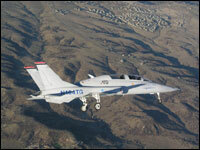 This plane has performance characteristics similar to some military aircraft. It even comes with military style ejection seats. In addition to the general aviation aircraft ATG is developing a Javelin MK-20 model that could be used as a military trainer. Looking at the list of technical features below you will see why the estimated cost of this airplane is approximately $2.795 million, which knocks it out of my price range, for now. But you have to dream, right? Time to climb to 41,000 ft (ISA, std day, 6,200 lb): 13 min. Cargo/Baggage: up to 200 lb.